Last year, one dominant question circled around the Houston Astros. Could they become the first MLB team in 18 years to repeat as World Series champ? As we now know that didn’t happen. That’s the bad news for Houston. The good news is that the Astros are well positioned to reclaim the title in 2019. In fact, as we enter the 2019 season, no team can match Houston’s overall talent. 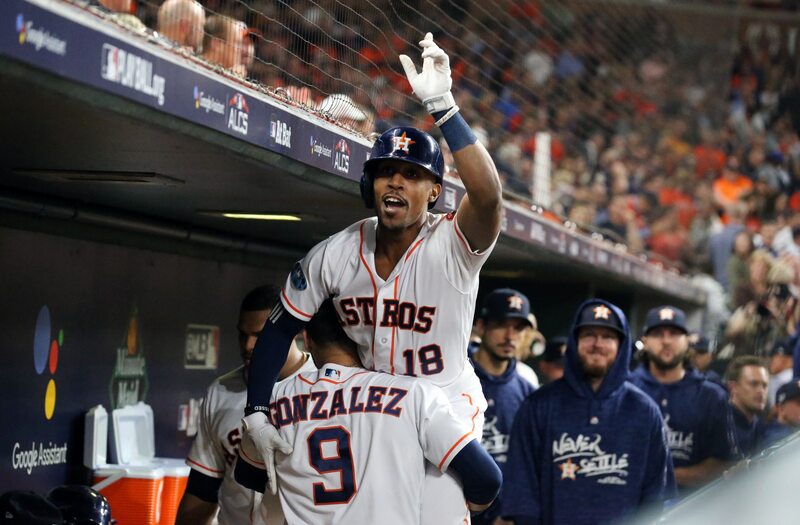 We start with the offense: As far as offensive cores go, it’s hard to beat what the Astros have. At season’s end, it would not be remotely surprising if Alex Bregman, Jose Altuve, or Carlos Correa won the MVP. George Springer would be a little more surprising, but not alarmingly so. Lead-off men don’t get much better and none are more dangerous. It also much be mentioned that as good as the offense was in 2018, it could have been better. Both Altuve and Correa dealt with injuries in 2018. Both are healthy heading into 2019. And this is not a four-man offense. Yuli Gurriel has been an invaluable piece. Tyler White is extremely dangerous. Michael Brantley is a great addition to the offense. And if either he or right fielder Josh Reddick get hurt or falter, Kyle Tucker — one of the best prospects in baseball — looms in the minors. Granted, the Astros are not the only great offense. The Boston Red Sox are stacked, as are the New York Yankees. The Oakland Athletics are a little one-dimension, but if you’re going to have one-dimension, you want it to be power. In the National League, teams like the Milwaukee Brewers and Philadelphia Phillies can pound the ball. But with the exception of the Red Sox, all of those offenses are very prone to strikeouts. It may seem antiquated to dismiss an offense because of that. But come playoff time, the teams that win are still the ones that make contact. Even if you put the Red Sox (or any of the other offenses) above the Astros, it won’t be by a big margin. The same can be said about the starting pitching: Only Houston has far fewer rivals in that department. None of the teams with an offense comparable to the Astros can match their starting pitching. The only team that really can at all is the Cleveland Indians. And to be frank, Houston losing Charlie Morton to free agency and Lance McCullers Jr. to Tommy John Surgery, Cleveland’s starting rotation is probably better. Justin Verlander and Gerrit Cole is still about as good of a 1-2 punch as MLB has to offer. Wade Miley is a solid No. 3. Also, both Brad Peacock and Collin McHugh were aces out of the bullpen in 2018 and have starting experience. So, the cupboard isn’t exactly bare. And even if the Indians have a better starting rotation, the gap is not wide enough to overcome the Astros elsewhere. That brings us to the bullpen. This is an area where teams like the Brewers, Yankees, and A’s have a pretty significant edge over Houston. But the Astros bullpen is not a weakness: In fact, it’s quite good. A full season of Roberto Osuna will help. Osuna has a career 2.78 ERA and 0.916 WHIP. For the full 2018 season, he had a 2.37 ERA and 0.974 WHIP and posted a 1.99 ERA and 0.882 WHIP with Houston. That’s a solid anchor. He’s a better pitcher than he is a person. Josh James posted a 2.35 ERA, 0.957 WHIP, and an 11.3 K/9 rate in 2018, but did so in only 23 innings. Over a full season, that should double. That will only buoy the bullpen. Houston will also get a full season of Ryan Pressly (2.54 ERA, 1.113 ERA, 12.8 K/9). That will only help. The bottom line: In specific areas, some teams might have an advantage over the Astros. But those teams all have weaknesses. We can’t say that about Houston. This team is really good-to-great in basically every part of the game. Of course, individual postseason series are very hard to predict. The small sample size makes October baseball so frustrating and exciting all in one piece. But we can say this. If a team is going to beat the Astros, they need to play a virtually flawless series. That makes them hands down the best team heading into the season.